Davd Buchanan has admitted that the confidence in the Cobblers camp is ‘fragile’ following last weekend’s damaging 5-1 defeat at Oldham. And the experienced campaigner says the Town players ‘simply have to find something’ in the upcoming Sixfields double header against Walsall and Blackburn Rovers. Buchanan admits the performances of the Cobblers players hasn’t been good enough during their current run of six matches without a win, and that the manner of defeat at Boundary Park was ‘upsetting’. But he has assured the club’s supporters the players are doing all they can to turn the season around, and they will now be working even harder to find the answer. Asked if the confidence of the squad is fragile after the thrashing at the hands of the Latics, Buchanan said: “I think it has to be, doesn’t it? “For me, it doesn’t matter who you play against, whether it’s Oldham or Manchester United, to come off a 5-1 defeat like that is upsetting. “I take that to heart, but we are trying and we have a good group of lads in the changing room I can assure you of that. “We simply have to find something in these two home games. “We all have to stand up and be counted, we are in this together as it is a team game. “It’s not about individuals, although obviously form is not good from a lot of players, but we are the only ones that can turn it around. 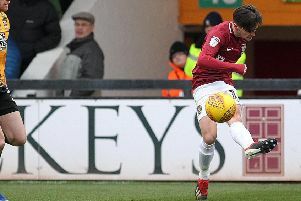 Buchanan has been one of the more consistent performers for the Cobblers so far this season, but he knows he can play better, and that is something that goes for the rest of the squad as well. “Every time I put a Cobblers shirt on, I give it my all, but I get paid to do that,” said the 31-year-old. “It hurts to lose, especially for this football club, because it means so much to me, but my form has got to be better. “And not just my form, everybody’s form has to be better, and when are getting beat 5-1 the first person you have to look at is yourself. “I analyse my performances every game, and I have to look in the mirror every day and ask myself what could I have done better?